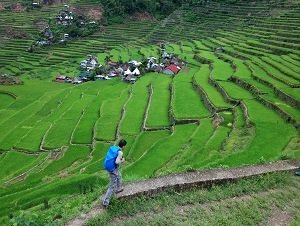 If you wish to see more of the Cordillera with less of the camera-toting, selfie-posing crowd, Batad may be just the right destination for you. Famed for its sweeping panoramic views of its jaw-dropping amphitheater-like rice terraces, this village will quietly shush you with its beauty and charm. Once in the village, you will soon find out that there are no poor spots - you can point your camera phone anywhere and you will always end up having the money shot. If you are one of those travelers who go out to wipe their work woes away, this place will surely provide an interesting distraction as it forces you to work your hiking legs and stretches your mind to figure out how the heck they managed to carve the mountains using basic and minimal tools to make way for ancient irrigation. Now if only all distractions are this healthy and picturesque. So come now and join our Batad tours as we discover more of the north! 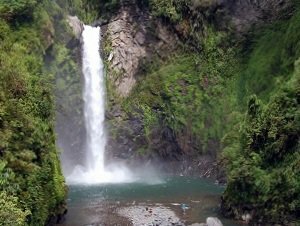 With our streamlined booking process, you will be at Batad in no time. And with our reasonable tour rates, you can spend more your resources on having more life-changing adventures with strangers who will surely be your future friends. With even just a weekend, you can definitely indulge on some much-needed recharge time with our tour package - no fuss, just straightforward fun at the rice terraces punctuated with a cold swim at the Tappiyah falls enveloped by the local's warm blanket of hospitality. How can you go wrong with that? We also have PROMO rates. Please keep in mind that the price depends on the number of people in your group. 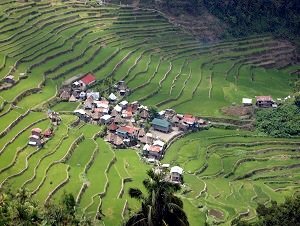 Cordillera's pride: visit Batad now! Departure from Manila will be at 10PM. 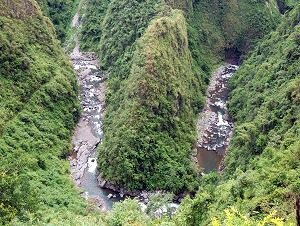 There will be stops on the way to Banaue town, Ifugao so you can stretch your legs, have some snacks and use the toilet. Travel time is around 9 hours, depending on the road and weather conditions. Once in town, unload your bags and have your breakfast. After your meal, you will transfer to a jeepney or tricycle that will take you to the village. Travel time on-board the jeepney/tricycle is around one hour. You will start your walk here and after 15 minutes, you will reach Batad village. You can check-in and freshen up. Make sure to change and get ready for a full day hike. Before leaving the lodge, make sure that you are wearing proper hiking shoes/sandals and clothes. We highly recommend that you get a hiking stick (usually provided by the lodge). Don't forget your trail snacks, water and packed lunch. 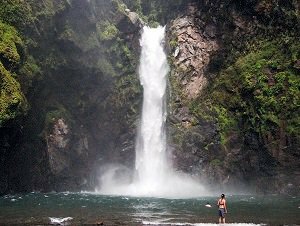 As you will most likely swim at Tappiyah falls, we suggest that you already wear your swimsuit under your hike clothes. It is typical to have some passing rain showers while hiking so make sure that your bag is water-resistant or wrap your things in plastic. Better yet, place your belongings in a dry bag. After a long day of physical activity, you can return to your lodge, relax and share stories over dinner. Don't miss tasting the rice wine called tapuy. It's the Igorots' way of combating the cold nights. Before going to bed, you may pre-order your breakfast for the following day so the staff can make necessary arrangements. Wake-up call the following day is around 7AM. Enjoy your hearty breakfast as you need to be at the parking area on or before 10AM, for the jeepney transfer back to Banaue. If you haven't done so the previous day, you can ride on top of the jeepney (top-loading) like locals do. Be warned: it is uncomfortable, bumpy and very windy (wear a wind-breaker) BUT it provides the best place to get your photos. 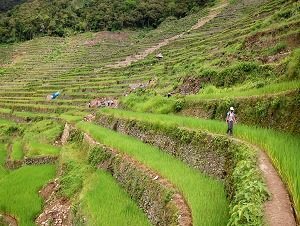 You will have ample time to explore the town proper and its eponymous rice terraces, buy souvenirs and have your lunch. The schedule for the return trip is fixed so make sure you are ready by then (please check your itinerary). Another 8-hr trip and you will find yourself back in Manila, exhausted but with a camera full of beautiful photos and a sense of adventure happily fulfilled. . It is to your benefit to set your expectations right when it comes to the housing and eating arrangements. Unlike its sisters in Sagada or Banaue, the rooms in the lodges are spartan. They are all clean but come with basic linens (pillows and blanket). Be prepared to bring your own towel. All toilets and bathrooms are communal so don't forget to pack with you your basic toiletries (best stashed in a bag that can be hung on hooks). Don't be surprised if you find yourself sharing a room with moths or fireflies. They are regular residents of the area. Most lodges have its own in-house cafeteria/eatery that serve basic rice meals either with vegetables (e.g. chopseuy) or meat (chicken or canned tuna), bowls of hot noodles, soups (usually sinigang) and hot drinks (instant coffee, tea or chocolate). Every now and then, pizza (or their version of it) will pop on the menu. Don't expect anything fancy. Here you eat to fuel your body and not necessarily to tease your palate. Meal cost is higher than that in the city so budget accordingly as credit cards/cheques are not accepted. Make sure to pre-order your dinner, telling them when you want to eat, before you head out exploring in the afternoon. Last minute-orders are frowned upon. © 2017 TRIPinas Travel and Tour Ventures, all rights reserved.